While surfing a bit on Brad DeLong’s blog I came across a reference to what looks like a very interesting paper by one of my favourite economic historians – Barry Eichengreen. He has co-authored the paper “Political Extremism in the 1920s and 1930s: Do German Lessons Generalize?” with Kevin H. O’Rourke. As usual when I see an interesting paper I want to share the reference with my readers before even reading the paper – this is also the case this time around. First, why only rightwing extremist parties? Why not also communists and other left-extremist parties? After all it was not only the nazis and other rightwing extremist parties that did well in the German elections in 1932, but also the Communist party. Second, even though I think there is reason to fear that the present economic crisis can lead to extremism I must say that one of the positive surprises about this crisis has been that we have not seen a general rise in political extremism and even better we have not seen the kind of political violence that we saw in many countries in the 1930s. The Baltic States which truly have gone through a very deep recession since 2008 have so far come through the crisis without seeing any significant rise in extremism. There are of course horrible examples in Hungary, Bulgaria and Greece, but even in these countries the extremists parties are not in power. 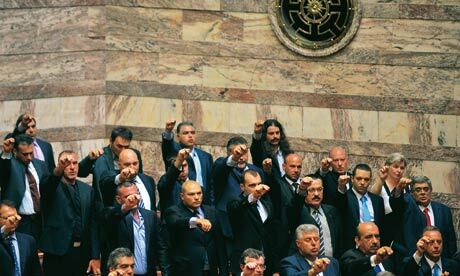 Luckily these guys (“Golden Dawn” parliament members in Greece) are ‘outliers” today. Unfortunately, you fall in line (as does the paper) with false perception that the media repeats day after day to spread support of their darlings and fear of consevatives. The Nazis were and are National Socialist. The nationalized everything and stop wealth from most everyone. Nazis are to the “Left”. They are not “right wing”. Sorry for the poor grammar in my comment. For some reason this phone does not let me see what I’m typing. @Barry Sobel: You fall in the same right/left trap as all apologists of the far right. Left is liberty, right is authoritarianism. Islamism, Stalinism, Hitlerism… it doesn’t matter which. They are all right wing. As a matter of etymology, right and left reffered to the seating in the French National Assembly. To the right the defenders of the Ancien Régime, to the left the reformers: people like Frédéric Bastiat, the torchlight free market champion, and the icon of left wing anarchy, Pierre-Joseph Proudhon. Market monetarism is a break from l’Ancien Régime, a libertarian alternative, and thereby a challenge to both conservatives and statists (i.e. the authoritarian “right”). Mats, thanks – that is exactly how I would like to see it. For the same reason I get upset when people like Krugman calls Market Monetarism ‘conservative’. Why do you think this is? Just the more general level of prosperity that we started from, the relatively lower severity of the drop, superior institutions, more open borders and reduced power of individual states…?